No matter the season, my kids love to eat ice cream. My 6 year old has a hard time eating most fruits. She is fine with veggies, but for some reason, she can’t handle fruit. I have come to learn that it is mostly a texture issue for her. She will drink a smoothie with any kind of fruit in it, or eat a homemade popsicle with fruit in it, but a plain piece of fruit she struggles with. So combining the nutrition of fruit with the delicious appeal of ice cream is a winner at my house. 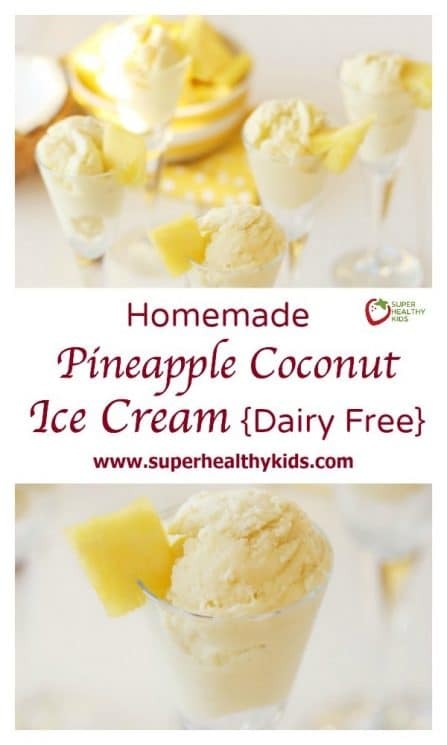 This homemade pineapple coconut ice cream is smooth, refreshing and a great treat even if you can’t eat dairy! My favorite thing about making homemade ice cream, is how few ingredients you need. 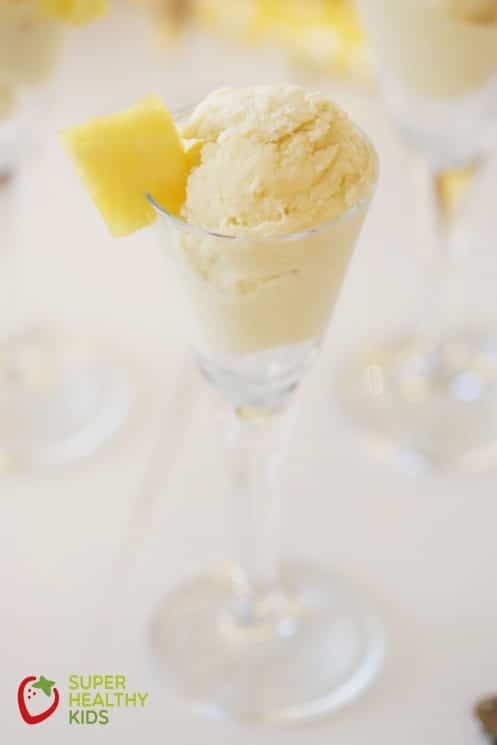 This pineapple coconut ice cream has only 3 ingredients. Frozen pineapple, frozen bananas, and coconut milk. Dairy free ice cream!!! Plus the cleanup is super fast because you only use a food processor! I’m sure you could make it in a blender, I just haven’t tried it. You can buy fresh pineapple and freeze it, or if it is available I buy the frozen pineapple chunks from Costco. As a side note – I have a few other recipes with coconut milk on the site. My favorite brand is the Thai Kitchen brand. 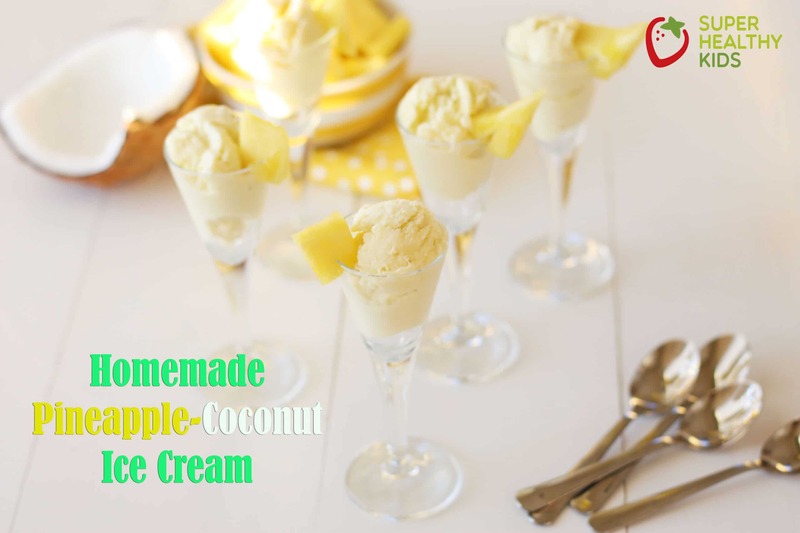 For some reason I feel like the coconut cream separates from the milk better and that is the part that gives these recipes the really creamy texture. Add your ingredients to a food processor and pulse until they begin to combine and become smooth. Turn it on and let it blend until you get a smooth creamy texture. If you like a more soft serve texture, serve it up immediately. If you like a more icy formed texture, put it in a container and freeze until it hardens up a bit. This takes about 20-30 minutes. This homemade ice cream is really yummy on its own, but I think it would also be good topped with toasted coconut, or homemade hot fudge. Mmmmmm. 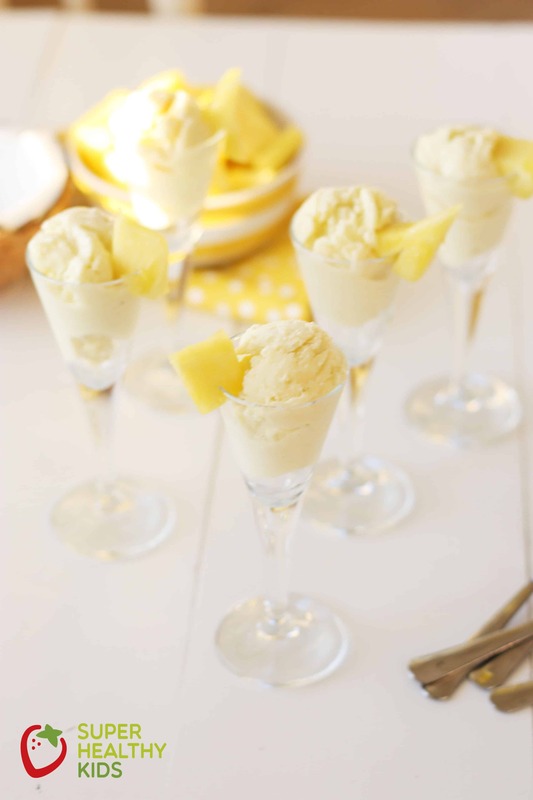 Definitely a tropical treat however you serve it! If your pineapple and banana are not frozen, freeze until solid. Place your coconut milk in the freezer upside down for a few minutes. You want to use as much of the cream as possible and this will help separate the cream from the milk. 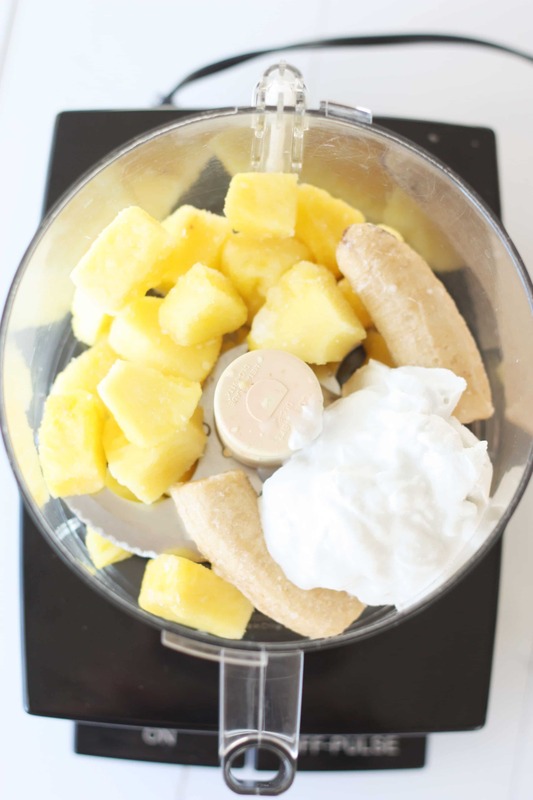 Place frozen pineapple chunks, banana, and coconut milk in a food processor. Pulse until ingredients begin to combine. Serve immediately as soft serve ice cream, or freeze 20-30 minutes for a more firm texture. Is coconut milk & coconut cream the same thing? The coconut milk I buy in the can doesn’t have the consistency of the cream you have pictured in the food processor. The coconut cream I was referring to is just the thickened part of the coconut milk, If you chill coconut milk in a can, the cream part will separate. I have had others try it with just the coconut milk and it has worked fine. Can we use regular milk cream instead of coconut milk ???? Is there a particular reason why you use the cream from the coconut milk rather than using a can of coconut cream? YUM…..my favorite ice flavors blended! In the body of the blog, you list one of the ingredients as coconut milk specifically Thai Kitchen brand. Then, in the actual recipe, coconut cream is listed. One in the same? It is the Thai Kitchen brand coconut milk that I used. Mine was chilled and I just used the cream that was separated from the milk. Hi-same question generally as above. Do you buy a can of coconut milk, then use 1/2 cup of the cream after it separates in the freezer? That is the gist I get from above, but the recipe reads like you only use a 1/2 cup milk then skim off the cream after freezing it-which might only be a few tablespoons? Thanks, I am making this since I already have all the ingredients! Sorry for the confusion. I used 1/2 cup of ‘cream’ – so basically I used the thickened cream part that had separated from the milk. But 1/2 total. Hopefully that makes sense. Definitely going to make this! Thank you so much for posting. I’m going to use a can of coconut cream rather than coconut milk as that sounds like what you’re using. How exciting! I also wonder about the amount of coconut cream, but also the pineapple. The amount only says 2-. Does this mean 2 cups? Thanks for this recipe. I have a vitamix, which is wonderful for making ice-cream. Sorry about that! It was a typo – yes it is 2 cups. Fixed on the recipe now! Thanks! I just made this. I only had about 1 1/2 cup pinapple and 1 banana and some leftover Thai Kitchen coconut milk. I had already shaken the can very well before opening to mix the cream into the milk (otherwise you get a bunch of cream around the lid). After shaking it has the consistency of heavy whipping cream. I did not measure, just added my fruit and poured in milk until it was creamy enough to blend and it worked just fine. I estimate I did use about 1/2 cup milk, maybe a little less. It was very yummy!! Thank you for this. It’s lovely to see a recipe with no added sugar/sweetener/salt etc. They seem few and far between nowadays. Do you think it would be ok to use fresh fruit and then freeze for longer? i think it would work fine. It might not be as creamy, because the faster something freezes, the less ice crystals form. Brenda – are you allergic to other nuts? You could try almond or cashew milk. Rice milk would also be another substitute. Could this be frozen in lolly moulds for children? It finishes pretty thick, but if you let it soften you could probably spoon it into molds. Great recipe!! Had a rough day and didn’t want to completely take it out on my waistline! Thanks for sharing! This is sooooo delicious! An excellent treat for a “zero sugar added” diet and satisfyingly yummy! Fantastic. It was so tasty, me and kids loved it. 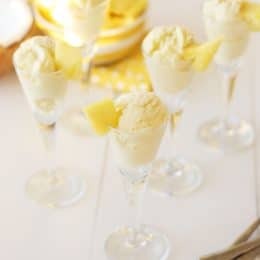 Question did you whip the cream and mix with the pineapple? Or just pour heavy cream and pineapple and stir together? Hi Rhonda, yes, either kind of coconut milk will work.